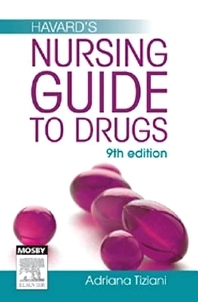 This ninth edition of Havards Nursing Guide to Drugs continues to provide reliable, accurate drug information for nursing and midwifery students and practitioners. All content in this must have nursing drug handbook, is tailored for nurses and midwives in Australia and New Zealand.User-friendly and fully up-to-date, this indispensable nursing textbook delivers safe drug administration information regarding form, action, use, dose, adverse effects and interactions in compliance with current pharmaceutical guidelines by the Therapeutic Goods Association (TGA).Each therapeutic drug class features a detailed description, followed by an A-Z of drugs within that class. Important Nursing points and cautions throughout this edition highlight best practice in drug administration. Patient teaching and advice has been included to emphasise an essential part of care within a multidisciplinary team.This edition also features icons that indicate drug cautions during pregnancy and breastfeeding, and another that indicates drug-specific restrictions in sport. A bestselling Elsevier textbook, Havards Nursing Guide to Drugs has been the premier drug guide for nurses and midwives since 1983. Havards Nursing Guide to Drugs 9th edition will also be available for separate purchase as an app (iOS and android) and provides an easy reference, searchable version of the text in mobile format for students and practitioners to carry with them during clinical practice.Also, available for separate purchase to be used alongside the Havards Nursing Guide to Drugs app will be the Tiziani Drug Calculations app. When both apps are purchased the user will be able to share function, content and data between the two applications. This link will provide cross reference from the text to case studies and drug calculation MCQs, placing the pharmacology in a clinical context. Drugs listed by therapeutic class and by body system.